Photograph of Harrison P. Davis (#15). 1971. Virginia's football team was integrated in 1970 with the signing of four African-Americans: Harrison Davis, Stanley Land, Kent Merritt and John Rainey. 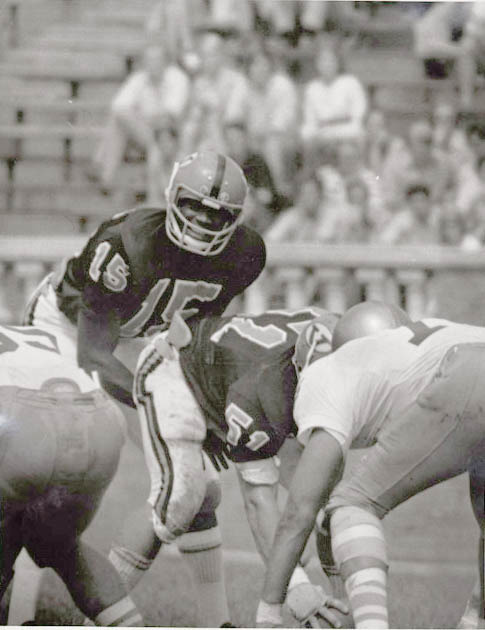 Though he was a tremendous athlete, Harrison Davis's placement as a quarterback at UVa was not well received by the Virginia fans nor students and his years on the gridiron were wrought with controversy. Following graduation, Davis went on to pursue a professional career with the San Diego Chargers.